Shell companies in the Philippines’ (SciP) “Isang Daan Tungo sa Kinabukasan” (One Road Towards the Future) campaign goes to Palawan in a dazzling float exhibition that showcases the country’s premier energy project –the technologically innovative Malampaya Deep Water Gas-to-Power Project that Shell operates on behalf of Joint Venture Partners. 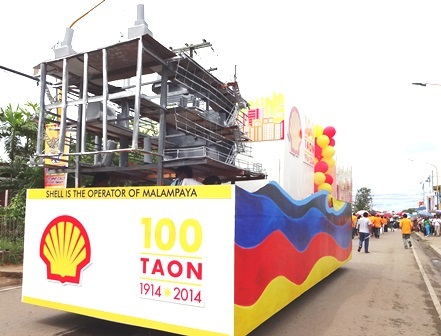 The Shell 100 years float at the Baragatan Parade showcasing the Malampaya Gas Platform located offshore of Palawan. Shellis one of the sponsors of the Baragatan Festival in Palawan that is celebrated annually to commemorate the founding of the civil government of Palawan. From the Cuyuno word “bagat”, Baragatan means the convergence of people, made festive by the sharing of unique songs, dances and music from the colourful diversity of municipalities that make up the province of Palawan. 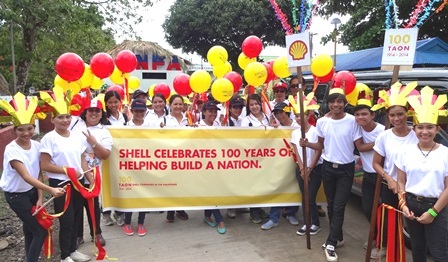 Palaweño youth join the Shell festivities at the Baragatan parade by marching and dancing to the tune of the Shell centennial hymn “Isang Daan Tungo sa Kinabukasan” played throughout the exhibition. 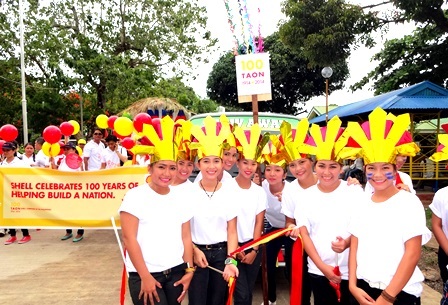 The different shades of colours and flavours unique to each Palaweño municipality are showcased in Baragatan’s cultural presentations, trade shows, exhibitions, float parade and street dancing that lasts for the whole month of June every year. 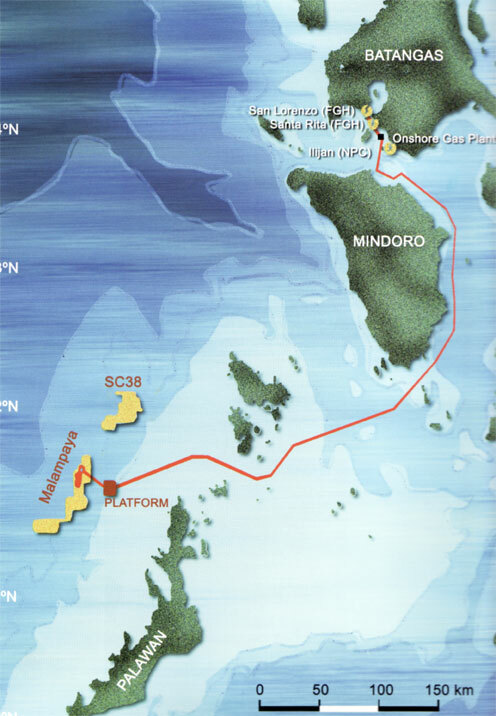 Palawan is important to Shell because it is the nearest province to the Malampaya offshore gas platform, and is one among several provinces where the 504-km long underwater pipeline traverses to deliver gas to the Batangas Onshore Gas Plant for electricity generation. The Malampaya Gas Project powers 25% -30% of the Philippines’ electricity needs with cleaner-burning natural gas. More than supporting energy security, the project also contributes billions in government revenue share, provides thousands of jobs and enhances Filipino capability to become at par with international oil and gas industry standards. 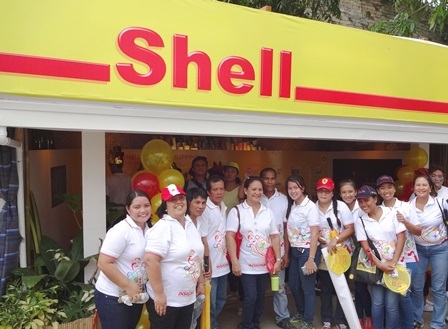 Posing by the Shell station exhibit are the officials from the Pilipinas Shell Foundation, Inc. (PSFI) and Palawan depot staff of Pilipinas Shell Petroleum Corporation (PSPC). 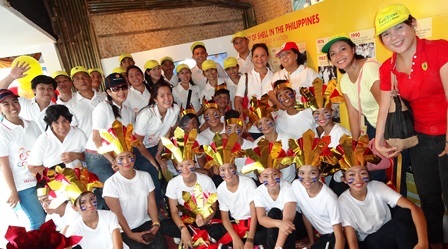 Representatives from PSFI led by Programme Manager Marvi Trudeau [3rd from left] together with the youth performers prepare for the float parade. Aside from the float parade, streets and roads of Puerto Princesa were lined up with an array of banners showcasing Shell’s social investment programmes that empower the lives of Palaweños, including the internationally recognised Movement Against Malaria (MAM), Tribal Education and Livelihood Programme (TELP), support to Tubbataha Natural Reef Park, Sanayan sa Kakayahang Agrikultura (SAKA) and Sanayan sa Kakayahang Industriyal (SKIL), among others which has altogether benefitted thousands of Filipinos. 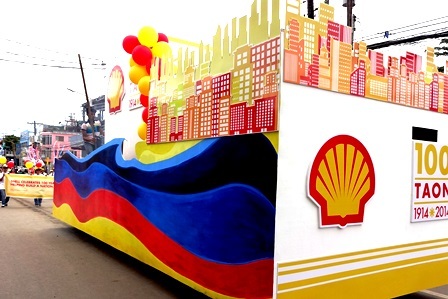 Participating in the colourful Baragatan Festival is part of Shell Philippines’ reaching out and expressing gratitude to the whole country for helping Shell reach 100 years of doing good and sustainable business in the Philippines and for Filipinos.